White Corn Meal Enriched with Vitamins (Niacin, Thiamine Mononitrate, Riboflavin, Folic Acid) and Iron. Thank you so much for contacting us. Our research shows that approximately 88% of the corn grown in the US is genetically modified in some way. Our corn suppliers do not claim to be non-genetically modified. We hope this information helps. Oh yes, it surely does. Is there a possibility you will acknowledge this on your packaging? Thank you! 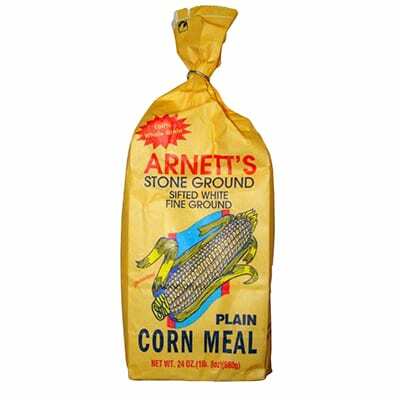 I just purchased a bag of your sifted White stone ground self rising Corn Meal at a local IGA near Palm Coast here in Florida. I bought it because our last name is Arnett.😀. I made the recipe for Corn bread in my muffin tins. Delicious. I drizzled a bit of honey on to eat it. Thank you!